Wiltshire or the County of Wilts is situated in the south west of England and borders the counties of Dorset, Somerset, Hampshire, Gloucestershire, Oxfordshire and Berkshire. Along with the rest of South West England, Wiltshire has a temperature climate which is generally wetter and milder than the rest of the country. Wiltshire, mostly rural, is made up of high chalk downlands, limestone downlands, wide clay valleys and dales providing a beautiful rolling landscape. The largest vale is the Avon Vale with the River Avon cutting diagonally through the north of the county, flowing through Bradford-on-Avon and into Bath and Bristol. The Vale of Pewsey cuts through the chalk into Greensand and Oxford Clay in the centre of the county. The Vale of Wardour is in the south west of the county and to the south east are the sandy soils of the northern most area of the New Forest. The highest point in the county is the Tan Hill-Milk Hill ridge at 295 m (968ft) in the Pewsey Vale just north of Salisbury Plain. Wiltshire is known for its pre-Roman archaeology and the Mesolithic, Neolithic and Bronze Age people built settlements on the hills and downland. Stonehenge and Avebury are the most famous Neolithic sites in the UK. The largest area of chalk is Salisbury Plain a semi-wilderness used mainly for arable agriculture and by the British Army as training ranges. The famous Stonehenge, Avebury stone circles and other ancient landmarks can be found on Salisbury Plain. Wiltshire has many country houses open to the public including Longleat near Warminster and the National Trust’s Stourhead near Mere and the City of Salisbury is known for its mediaeval cathedral. The Hampshire River Avon at 60 miles long rises at Pewsey in the county of Wiltshire and flows through the city of Salisbury and the county of Hampshire before reaching the English Channel through Christchurch Harbour at Mudeford in the county of Dorset. It is known as the Hampshire Avon or sometimes the Salisbury Avon in order to distinguish it from the other River Avon’s in England. The river actually begins as two separate rivers the western Avon rising to the east of Devizes, draining the Vale of Pewsey, and the eastern Avon rising just east of Pewsey. They merge at Upavon then flow across the Salisbury Plain, through the New Forest at Fordingbridge and Ringwood to meet the River Stour at Christchurch. The River Avon one of the most bio diverse chalk streams systems in the UK is thought to contain more species of fish than any other river in Britain. The river along with its major tributaries and some areas of adjacent wetland has been designated as a Special Area of Conservation (SAC) to protect its rare habitats and species, including flowing water vegetation, populations of Atlantic Salmon, Bullhead, Desmoulin’s Whorl Snail as well as Brook Lamprey and Sea Lamprey. The river is also important for the Water Vole and Otter which are making a good recovery after years of decline. Salisbury is a cathedral city located in the south east of Wiltshire on the edge of Salisbury Plane. Although it was not established as a city until 1220 there has been a settlement had been in the area since prehistory. It is the only city in the county and sits at the confluence of five rivers, the Avon and four of its tributaries the Nadder, Ebble, Wylye and Bourne. Located in a valley the area is largely of chalk and the rivers which flow through the city have been redirected, and along with landscaping, have been used to feed the public gardens. The Queen Elizabeth Gardens are very popular in the summer due to the shallow and slow flowing water. Close by are the water meadows where the water is controlled by weirs and because of the low lying land the rivers are prone to flooding especially in the winter. Often described as the City in the countryside Salisbury retains much of its historic past with timbered buildings, an early English Gothic Cathedral home to the famous Magna Carta, a thriving market, a buzzing arts scene, museum’s and some of England’s finest historic houses. Salisbury, commended for its arts and culture, was awarded Purple Flag status in Autumn 2012 meaning that it offers a “gold standard” for the centre at night. To achieve this award the city had to prove that they are welcoming to everyone, offer safe ways for people to travel home and provide a good mixture of venues therefore benefitting from more visitors, lower crime and anti-social behaviour and improved perceptions of centres. The city has held markets regularly since 1227 and market days are on Tuesdays and Saturdays. In 1926 King Henry III granted the Bishop of Salisbury a charter to hold a fair lasting eight days from the Feast of the Assumption of Mary. Today the fair is a funfair held in the Market Place over three days from the third Monday in October. Salisbury also holds an annual St George’s Day pageant the origins of which go back to the 13th century. In the 18th century the city was a popular centre for music and grammarian James Harris, a friend of Handel, directed concerts at the assembly Rooms for almost 50 years until his death in 1780. Salisbury ‘s city centre has many galleries and in the 18th century John Constable painted a number of landscape’s featuring the cathedral’s spire. Salisbury also holds an annual International Arts Festival which started in 1973 and is held in late May to early June providing a programme of theatre, live music, dance, public sculpture, street performance and art exhibitions. The Salisbury Playhouse produces between eight and ten plays a year as well as touring productions. Salisbury is a very attractive city and a popular tourist destination with a number of intriguing and interesting old buildings as well as the wonderful cathedral and just a few miles up the road towards Stonehenge is Old Sarum the original site of Salisbury. Old Sarum Cathedral, the first Salisbury Cathedral, was a Norman cathedral built on a hill at Old Sarum the original site of Salisbury which is just north of the modern day Salisbury (New Sarum). 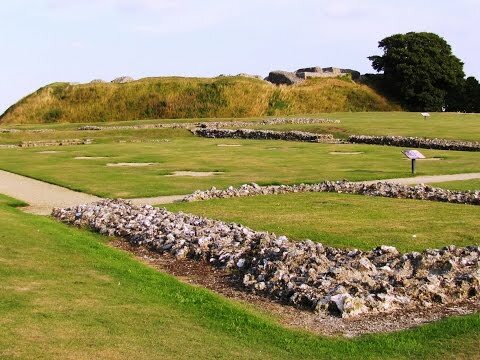 There is evidence of a Neolithic settlement on the hilltop of Old Sarum which became a hill fort in the Iron Age. After the Norman Conquest of England in 1066 William the Conqueror inherited Old Sarum from the last Saxon King of England. William used Old Sarum as a base of operations and he moved the bishopric from the Anglo-Saxon Sherborne Cathedral to Old Sarum appointing his nephew Osmund de Sees, St Bishop Osmund, as his chancellor and Bishop of Salisbury. The first cathedral was built on the hill by St Bishop Osmund between 1075 and 1092 but suffered extensive damage in a storm only five days after it was consecrated. A new larger cathedral was built on the same site by Osmund’s successor, Roger of Salisbury, and was completed around 1190. People have lived on this hilltop for around 5,000 years and the outer banks and ditches were constructed during the Iron Age to create a massive hill fort. It was later inhabited by the Romans and several Roman roads converge on the site. The Saxon’s followed and developed a town within the ramparts next came the Normans who quickly realised its strategic importance and constructed a motte and bailey castle within the old earthworks. They built the inner earthworks by 1070 and within the defences they built a royal castle, two palaces and the first cathedral they also installed a garrison in the river valley below. Old Sarum developed and became a thriving medieval city but as the cathedral grew more powerful friction developed between the relations of the clergy and the military governor. The city went into decline and the friction increased so much between the two powers that Bishop Richard Poore decided to re-site the cathedral and the bishopric was moved to its present place in Salisbury. The vitality and wealth of the church, combined with the exposed site, lack of space to expand the cathedral and the shortage of water at Old Sarum, also led to the cathedral being moved to the new site. By the 14th century a settlement had grown around the site of the new cathedral developing into Salisbury as it is today. A licence to build the new cathedral close wall was granted in 1327 and the wall was built in 1331. Some of the stones from Old Sarum were used in the building of the new Salisbury Cathedral and the Cathedral Close. The magnificent Salisbury Cathedral, formally known as the Cathedral Church of the Blessed Virgin Mary, is an Anglican cathedral and considered a leading example of Early English architecture. The main body took 38 years to build from 1220 to 1258 and has the tallest church spire in the UK. It also has the largest cloister and the largest cathedral close in Britain and contains the world’s oldest working clock, a stunning living water font and has the best surviving of four original copies of the Magna Carta. Volunteers offer a free guided tour of the cathedral or you may explorer it on your own. We park at Old Sarum and walk down towards the entrance and turn left through two gates and follow the path to the road. We cross straight over and follow the track uphill. We pass a farm and a tree line on our left and keep heading forwards to Keeper’s Cottage and a cross roads of tracks. We keep heading forwards on the track to the right of the cottage uphill. At the next cross roads of tracks we turn left until we meet the road. We turn left then after a short way we turn right passing a post box on the left and head forwards over two bridges until we meet another road. We turn right and after a short way we turn left at the t-junction. We head forwards slightly uphill, ignoring the first path on the left, and turn left through the gate just before some large barns. We head forwards downhill passing a small wood on the left until we meet the road. We turn right and keep following the road past Avon Farm Cottages until we come to Avon Farm. (For the shorter walk continue following the road to the t-junction, turn left then immediate right and keep following the road to Old Sarum.) We head forwards and follow the footpath sign to the right of the farm buildings. We keep following the path which becomes a track until we come to a cross roads of tracks we turn left to the bridge for a look at the River Avon then about turn back to the track turning left and continue along the track. When we see a gate on the left we go through it and walk through the meadow to the riverside. We now follow the river and cross over a bridge into a park area. We turn left and follow the track round until we meet the road. We cross straight over and pass under the road bridge and the railway bridge and follow the signs for Salisbury Cathedral. After a look at the cathedral we retrace our steps back to the park area and cross over the first bridge on the right. We then turn immediate left and follow the river on our left and past the leisure centre on our right. We keep following the path close to the river and eventually we meet a cycle track. We turn left following the cycle path past the allotments until we meet the road. We turn right then at the bend with a thatched house on our left we head straight forwards on the track soon going slightly uphill. The path splits and we bear left to go through a field. At the end of the field we turn left and follow the path along the ramparts. When we see a path on the right going over the ditch we follow it up to the top. This brings us out to the Old Sarum remains. We then make our way over the grounds back to the car park. This is an easy walk on footpaths, tracks, bridleways and one stretch of minor road. There are some stiles and gates. Elevation: Approx lowest point 45.4m (149ft) approx highest point 111m (364ft). Start Point: Old Sarum free car park. From the M4 take junction 13 and head on the A34 (dual carriageway) past Newbury and Whitchurch. Then at a main roundabout take the third exit onto the A303 (dual carriageway) to Andover. After passing Andover continue on the A303 then take the A338 at a roundabout to Salisbury. At Salisbury turn right onto the A30 then right at a roundabout onto the A36 (Churchill Way N) at roundabout turn right onto the A345 (Castle Road) following signs for Old Sarum and Amesbury. After about 1.25 miles Old Sarum and car park is on the left. To avoid Salisbury centre after passing through Winterbourne on the A338 turn right onto Spire View at the sharp bend just before crossing the railway line. Follow the road for about 1.75 miles. At the t-junction turn right onto Old Castle Road then left onto the A345 and immediate right to Old Sarum car park. Parking: Free car park at Old Sarum. There are public toilets in Old Sarum car park and also in Salisbury. For refreshments there are ample shops, cafes, tearooms, take-away, pubs and restaurants.